MAPA was founded in 1982 with the mission of preserving and protecting the heritage, natural environment and other unique qualities of life in the Mentone area! MAPA presents two annual festivals in Mentone which feature hand-made arts and crafts, live entertainment, and delicious food. Both festivals are celebrations of our community and the natural beauty that surrounds us. We invite you to come up to the mountain and celebrate with us! ​The Rhododendron Festival is held annually on the 3rd weekend of May. Colorfest is held annually on the 3rd weekend in October. MAPA also publishes ​The Groundhog, a monthly newspaper which highlights the people, places and events that make Mentone unique. For more information on subscribing, submitting an article, or purchasing an ad, click here. 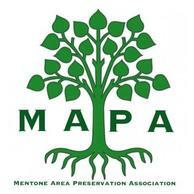 Your MAPA membership directly helps us accomplish our mission of the preserving and protecting the heritage, natural environment and other unique qualities of life in the Mentone area! The MAPA board of directors meets on the first Tuesday of each month at 6 p.m.
​at Moon Lake Community Library, 4607 AL Hwy. 117 in Mentone.